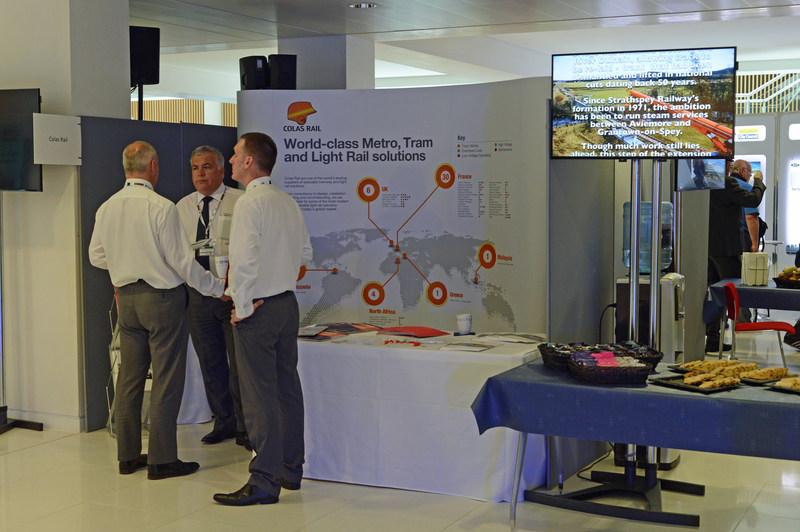 UK light rail conference 2015. It’s lunch break so I’ve a little time to start a blog from the event, which, so far, has proved to be very interesting. My difficulty has been in deciding which of the many different sessions to attend. The day started with a presentation from Nottingham Cllr Jean Urquhart (who has lead responsibility for NET) who spoke about some of the successes of a system which will carry 20m passengers a year. I’ll talk about these in detail when I’ve time to flesh this out. After her introduction we headed off to two other lecture rooms where we could choose from a variety of presentations. I plumped for the session on ‘low impact light rail’ which contained briefings from Paul Griffiths of Centro & Ian Jordan of Trelleborg. 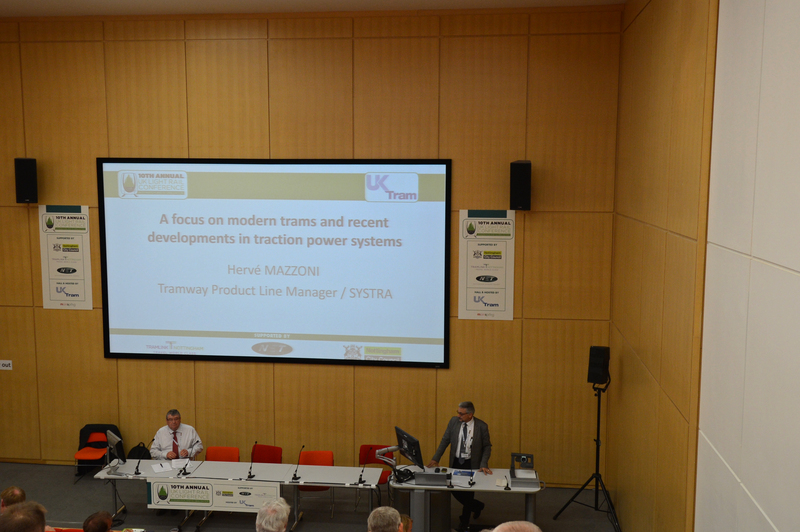 The brief centered on the opportunity to reduce the costs of building tramways by the use of modular track panels. These reduce the depth of excavations to lay tram tracks & prevent underground services needing to be disturbed or moved. (more later). The second session was a panel debate on driving down costs, although there were no easy solutions presented & the panel were quite pessimistic about the way decentralisation (& the new LEPs) are adding costs, not removing them. Well, I wasn’t disappointed. There were some excellent afternoon sessions! Mariana Kajen, MD (Middle East) of North Star gave a fact filled presentation on the rail market in the Gulf Co-operation Council (GCC) countries & the prospects for UK firms to do business there. One fact that really stuck in my mind was that Saudi Arabia are currently spending a whopping $44.8bn on light & heavy rail systems! I’ll include a couple of shots of her presentation later. Later, Hervé Mazzoni, SYSTRA’s Director of Systems Integration & RAMS gave a fascinating presentation on off-wire operation & energy recovery systems that manged to be both incredibly informative – and funny. When his presentation cut out he demonstrated that the old engineers trick of giving something a kick still works in the computer age. I had a chat with him afterwards & I was very impressed with his incisive knowledge. Here he is just before kicking off (literally) his presentation! 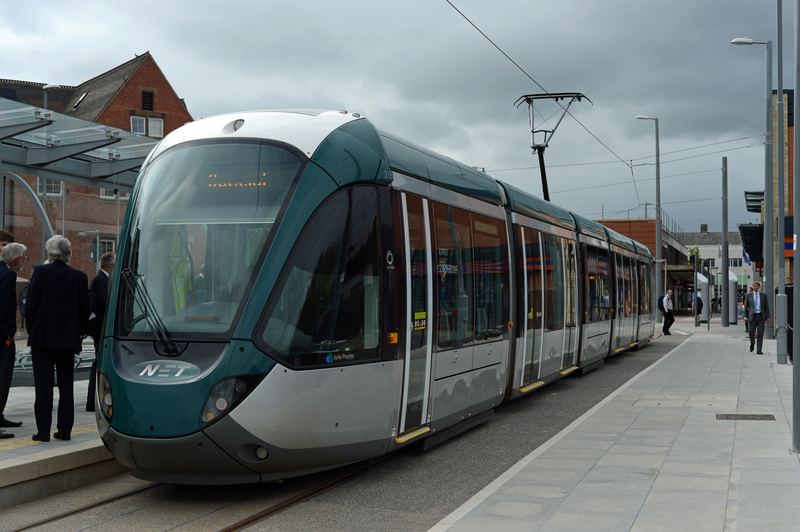 The afternoon ended with NET laying on a special tram to take delegates on a trip along the phase 2 route as far as Beeston, where we had chance for a few photo’s. Again, I’ll write more about this later. Our special tram sits at the single platform stop at Beeston. 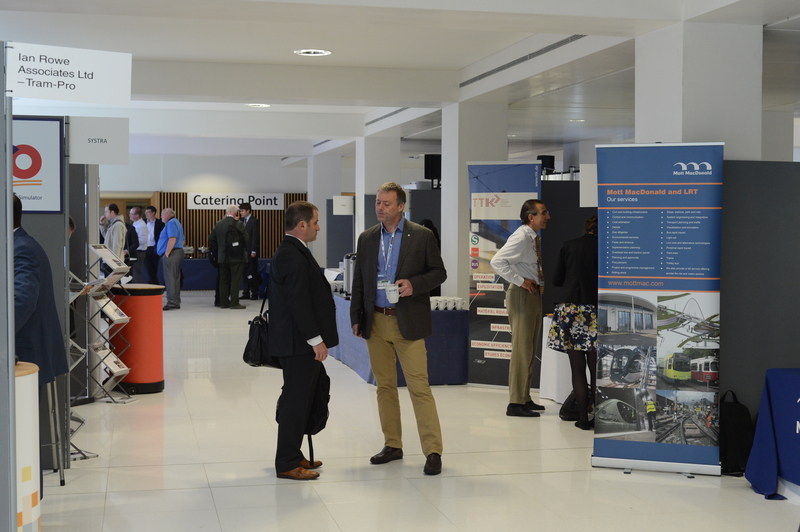 The first session I attended was a presentation from David Keay – HM Deputy Chief Inspector of Railways at the ORR. He gave a fascinating talk about the history of the railways inspectorate (which dates back to 1840). The ORR archives have a wonderful collection of old documents, one of which is a letter written by railway engineer George Stephenson to the Board of Trade, strongly supporting the establishment of a railways inspectorate. David related the fact that whilst Stephenson was a great supporter of the need for an inspectorate, fellow engineer I.K Brunel was vehemently opposed to the idea! David went on to tell the tale of some of the early Inspectors (all of whom came from the Army) and how the principle that the railway companies are ultimately responsible for safety was first established in 1879 following the terrible Tay bridge disaster. History dispensed with, David went on to describe how the current inspectorate operates & the establishment of ROGS, aka, Railways and Other Guided Transport Systems (Safety) Regulations 2006 which established Safety Management Systems (SMS). Next up for me was a panel debate on ‘High speed rail and multi-modal integration’ which primarily focused on how to maximise the benefits from Hs2. Paul Buchanan from Volterra set the financial scene whilst former Transport Minister Norman Baker dealt with political aspects. David Ralph, Chief Exec of D2N2 talked abot the Midlands perspective & the opportunities of Hs2 at Toton. Martha Grekos, a Partner at Irwin Mitchell left people in no doubt Hs2 was happening. She also talked about the momentum behind the project and the importance of planning ahead. The final session before we broke for lunch & I had to leave was a plenary debate on tram-train with Colin Walton, Metrolink MD Peter Cushing, Simon Coulthard, Network Rail’s project head, Tim Kendall (formerly of the DfT) and Dave Haskins, project Director from Metro (Yorks). This was the most frustrating session of the event. Whilst Simon gave us an update on progress (the first Vossloh vehicle will arrive in November) and some of the factors that have dragged to project out, we were left with no clear insight into why this project has been bogged down for so many years. It was clear the operators want to see results & are keen to adapt the technology, but I was left with a feeling what was unsaid was far more important. For example, why is the project costing 4 times more than the Karlsruhe system in Germany & why are we insisting on vehicle standards that aren’t mandatory? Despite those frustrations the conference has, to my eyes, been an excellent event that’s been well run, informative and entertaining. I hope I’ll be able to attend next year. Needless to say I’m heading there by train, so you can expect a fair few pictures from the journey to appear on my Zenfolio website. 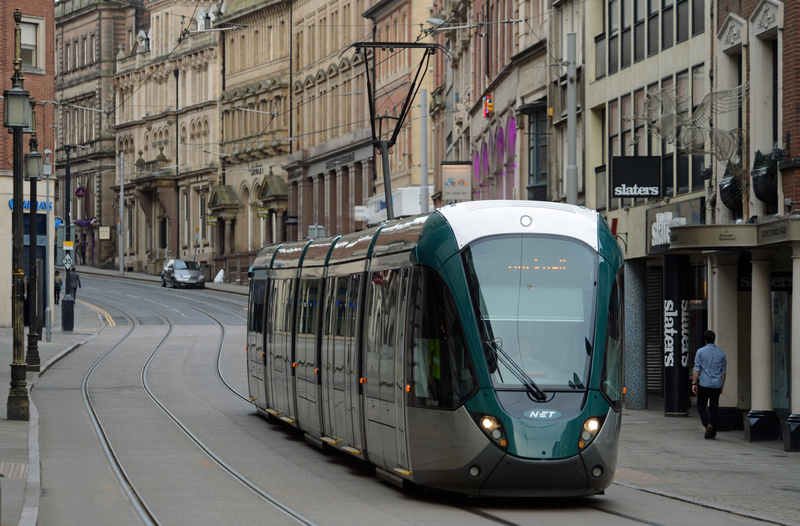 I’m keen to have a look the Nottingham tramway extensions so I expect to be able to include shots showing what NET has been up to. And relax! I’m checked into my hotel & now I’m taking a little time off to enjoy a pint in Nottingham town centre before sorting out some of today’s pictures. From watching the trams go by it’s obvious somethings going on as I’ve already spotted one or two familiar faces from the world of transport enjoying a ride on the new Alstom Citadis trams.